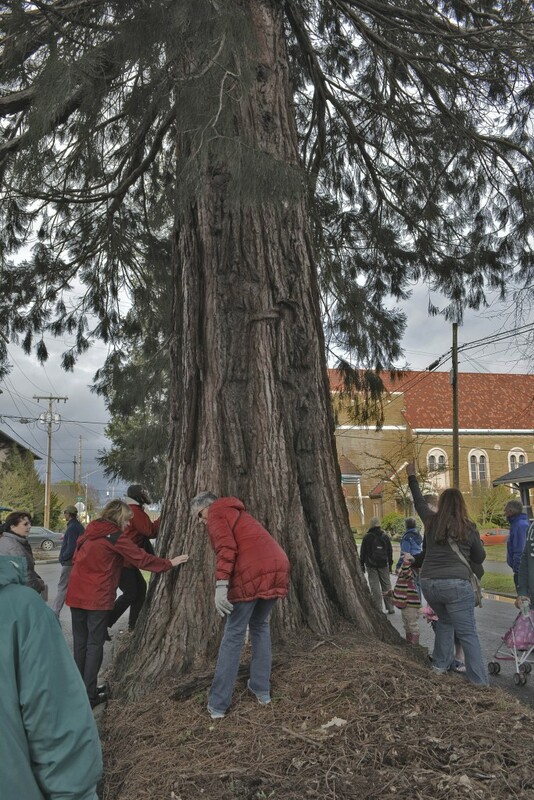 Photo of the big Sequoias on Veneta Avenue by Steven Fisher. Sometimes, the answers just lead to more questions. 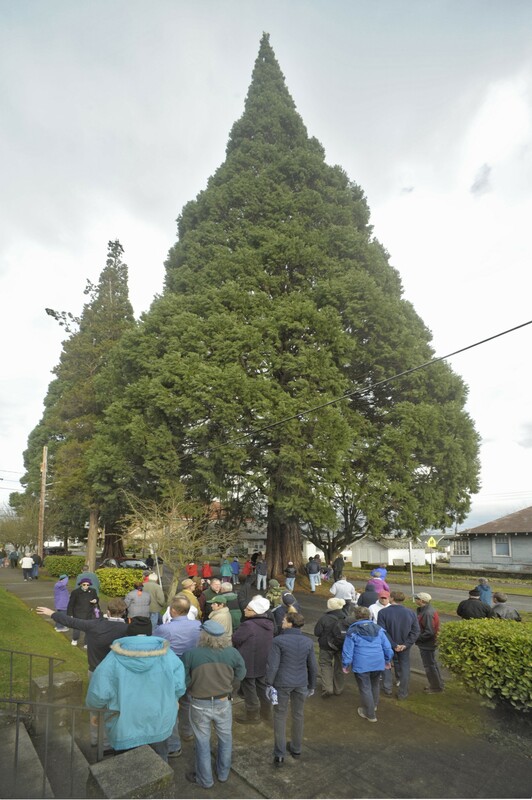 On Saturday, I led a group of more than 50 people on a tour of two prominent urban Sequoia trees, those pointy Bremerton landmarks on Veneta Avenue. 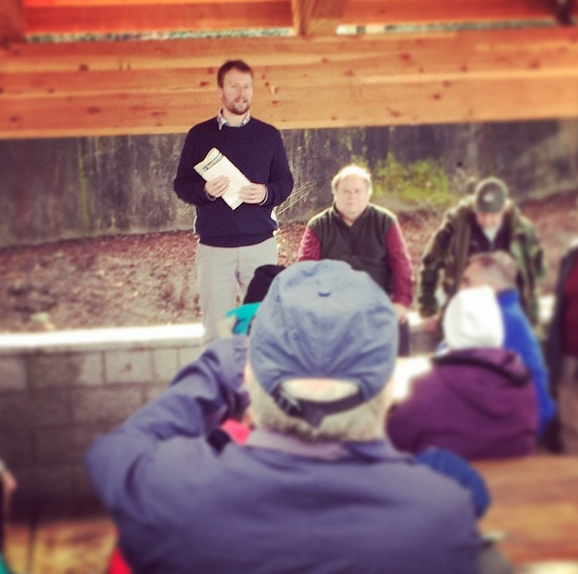 I was thrilled with the turnout, which included two tree experts in Jim Trainer and Olaf Ribeiro. 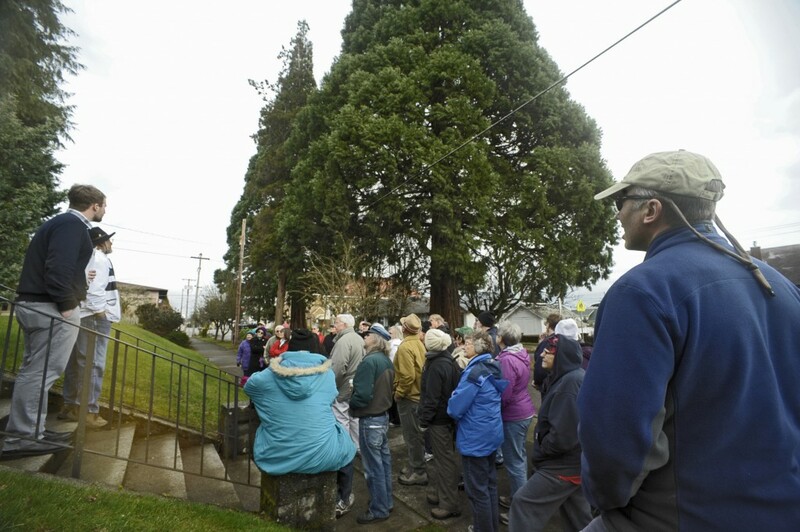 The bottom line: the trees are digging up the roadway underneath them and most people — including Bremerton Mayor Patty Lent — support taking out the road and making it a pedestrian path. There are no immediate plans on the table. Our tour Saturday took us from Kiwanis Park down to Veneta Avenue, where we talked about, measured and touched the trees themselves. Ribeiro is still doing some analysis on their width and age. Our arborists gave different ages of the trees, so that’s still a mystery. Their height is still a bit in dispute, too. And how come they have that pinecone shape? There were other questions that came up. So I’ve got more work to do. In the meantime, enjoy these photos. Oh, and those who came out: be sure to drop a note to let me know how you felt it went. Great turnout of the Community. It is great to see so much interest in our local Heritage Trees. I hope we can make this area into a pedestrian walking area and not a through street. What magnificent trees. I’m 100% in favor of taking the street up. I can’t wait to go see them. I remember these trees when they were decorated with lights for Christmas! They were beautiful!